In this article, Nick Shepley considers the background to and views on Western intervention in the Balkans in the 1990s. Before his death in 2010, historian Tony Judt discussed the Balkan Wars and their causes at length in his book Postwar. In the London Review of Books, in March 2010, he also discussed the historic roots of the lack of concern over the fate of the Balkans amongst her nearest European neighbors with the journalist Kristina Božič. Judt argued that in the 18th and 19th centuries, Europe fought predominantly colonial wars against non-European peoples, and treated even their most implacable European foes far better during conflict than their own colonized subjects. This process changed with the two world wars of the 20th Century. With the advent of Nazism and Soviet Communism, Europeans were colonized and exterminated by other Europeans, a process Judt describes as 'internal colonization'. 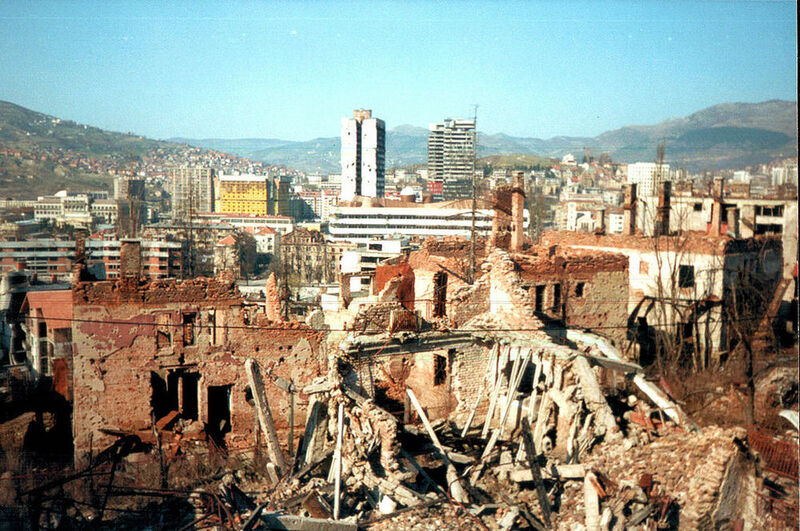 Ruins of Sarajevo, Bosnia. 1997. Following the siege of the city. Judt's stance on the Balkans, as a self-confessed social democrat and liberal interventionist (his faith in liberal interventionism was tested to breaking point over the Iraq War), was that the West had a duty to intervene and was woefully inadequate prior to, and during the 1990s NATO intervention. His argument is not that international meddling caused the wars, but that international inaction and indifference actually allowed them to happen. In Postwar, he places responsibility for the Balkan Wars largely at the feet of Franjo Tudjman and Slobodan Milosevic, claiming of the latter that the wars that wracked the region for seven years were of his design. Judt applauds Tony Blair's eventual intervention in the conflict as necessary and morally courageous, and is excoriating in his criticism of French, Dutch and Danish peacekeepers for their alleged complicity in the Srebrenica Massacre. Both historians, approaching the conflict from subtly different ideological and historiographical perspectives seem to concur that inaction, as opposed to interference, was key. He concludes that in Czechoslovakia and other former Communist states, few alternatives to free market economics and democratization existed, and there was an absence of ethnic division (or in Czechoslovakia's case it was a clear and easily resolvable one) to exploit. In the Balkans, the failure of Communism was followed by a retreat into ethnic nationalist politics, and given the intermingled nature of communities this was bound to result in conflict. America had recently washed clean the slate of national humiliation over Vietnam by successfully expelling Saddam Hussein from Kuwait in 1991. She had been determined not to become drawn into complicated and morally ambiguous ethnic conflicts within the multi-ethnic state of Iraq, and so did not advance into Iraqi territory. The Clinton administration that would come to power in November 1992 inherited a strong foreign policy legacy from George Bush Senior and was not keen to be seen, as Democrat Presidents sometimes are, as committing US troops to unnecessary wars. Judt doesn't offer much in defense or condemnation of this perspective, though he does state that it fails to take into consideration the role of Yugoslavians themselves in the crisis, something he argues is far more important. Eric Hobsbawm, in interviews with Antonio Polito in The New Century, discussed the eventual intervention in Bosnia by NATO, pointing out that part of the reason for the delay in acting and for the confusion over the nature of the mission was the uncharted political and diplomatic waters that the West was entering. It is possibly this reluctance, along with the disinterest cited by Judt that actually facilitated Milosevic's crimes, allowing him the luxury of knowing that any intervention would be a long time in coming. It seems highly doubtful that even these irredentist claims were serious or state led, perhaps more the demands of fringe nationalist parties and newspapers. Their overall effect was trivial compared to the forces within Yugoslavia that eventually tore the nation apart. Hobsbawm disagrees that there was a real sense, prior to the 1990s, that Yugoslavia would break up. In his interviews with Polito, he claims there was no good reason to think the multiple ethnic state housing multiple nationalities would 'splinter as a result of the political pressure of its nations'. As with Judt, the explanation of internal nationalist tension is as inadequate for Hobsbawm as the explanation of external meddling. Both historians seem to agree that it was a toxic and violent part of the process of the end of Communism, a blood-letting that the USSR had largely been spared. In The New Century, Hobsbawm states that Communism in Yugoslavia had not successfully penetrated people's lives in the way that religion might have; it simply prevented them from being motivated by other political ideas. One factor cited by both Judt and Hobsbawm in their writings that made intervention slow to materialize is a strange millennial historical amnesia that seems to have gripped the western world. Judt's analysis of this particular aspect of western culture - the decline in our ability to think about the past - touches on a number of key areas of public discourse, one of which is foreign policy. Judt was making clear reference to the debacle of Anglo American policy that was Iraq, but also his perception of a sense of western amnesia that derives from the myopia exhibited by European and American powers over the Balkans. Just as Mitterrand tried to ignite public memory in his visit to Sarajevo in 1995, Judt seems to lament our ability to see the historic dangers that emanate from the South Eastern corner of Europe. Hobsbawm clearly makes reference here to the missed opportunities for global security at the end of the Cold War and the making of a stable and comprehensive world order after Communism. Much of this obviously relates to the failure to help Soviet Russia to adapt from a command economy and a one party state, but also part of the West's failings after 1989 were to deal with the crises afflicting the states created during and after 1919. A clearer understanding of the consequences of Versailles, Lausanne, Sevres and Triannon might, in Hobsbawm's opinion, have motivated the West to act differently when the Balkan Wars began. For Judt, the real culprit is Milosevic, and he explicitly blames him in Postwar not just for the destruction of Bosnia Herzegovina in 1992, but for the other Balkan Wars as well. However, Judt does not follow a narrow 'great man' version of history. The circumstances in which Milosevic was able to create a series of wars in the Balkans result from the end of the Communist state and the failure of liberal democratic institutions to take root in Belgrade or in the other capitals of the region. Whilst countries like Poland assumed that the de facto alternative to membership of the Warsaw Pact was not necessarily embracing free market American capitalism, but acceptance into the EU, the Yugoslavs were not presented with anything like as compelling an opportunity. Whilst Poland's accession to the EU might have been credible, it seemed utterly inconceivable in 1992 that Bosnia, Serbia, Slovenia or any of the other former Yugoslav states would be invited to join. This played neatly into the hands of Balkan nationalist’s intent on territorial acquisition, as it made aggressive nationalism the only viable replacement as an alternative to Communism. Hobsbawm's argument that the lessons of other failed and partially successful attempts to win the peace after winning the wars should be observed by world leaders is particularly relevant here. Keynes attacked the myopic folly of Britain and France, knowing that the excluded, marginalized and ignored states of Europe, and the vanquished Germans, would not allow the Allies their triumphalism for long. Keynes fear, along with a minority of the British establishment, had been of a resentful, resurgent Germany, able to profit from an unstable Europe where acute national questions had gone unresolved. Unlike the case of Germany, there was no fear in the minds of post-Cold War planners that rogue states like Serbia would have grand continental wide ambitions and succeed in implementing them as Germany did. Milosevic did not have his equivalent of Weltpolitik; instead he was content to re-establish medieval Serbian borders and become a regional, rather than a continental, hegemon. At the same time, however, Yugoslavia was wedged between a liberal democratic western and now central Europe, allied under NATO, and with an EU membership rapidly expanding eastwards, and a post-Soviet Russian Federation, struggling to re-assert itself as a world power. Therefore the great danger was not that, left to their own devices the Serbs might build a vast arsenal and attack the West, but that interfering in their affairs could bring the confrontation that both sides in the Cold War had worked hard to avoid for fifty years. The other possibility was that of being dragged into a multi-ethnic conflict where all sides were guilty of war crimes, and whoever the West backed would be morally tainted in some way. There was the (later realized) fear that the war would often be fought by irregular troops, while America and Britain were particularly hesitant about being drawn into conflicts that were difficult to extricate themselves from owing to the lack of a clear exit strategy. A map of the states of the former Yugoslavia in 2008. Seen in this context, some of the criticism leveled by Judt and Hobsbawm at the western allies might be judged as unfair. Did they really suffer from a lack of historical insight, or had the lessons of countless internecine conflicts across the globe in the 20th century been learned? Was Eagleburger actually correct when he stated that NATO was powerless? Could the West have seized the post-Cold War initiative, and offered a new European settlement likely to lead to peace and security, as was created in Vienna in 1815, Berlin in 1876, Versailles in 1918, and at Yalta and Potsdam in 1945? The sudden collapse of Communism, and the lack of the experience of warfare amongst the populations of Europe probably made this impossible, especially if one considers the still fiercely insular and nationalistic Russian Federation. There was little on offer to the Serbs in 1992 other than Milosevic and his brand of violent irredentist nationalism, and western military planners distanced themselves from the conflict, looking upon it as Communism's tragic 'fall out'. Both Judt and Hobsbawm are right to suggest that many Serb crimes were facilitated or exacerbated by NATO forces who stood by as killings took place. Srebrenica is the clearest example of this, but again, this is due to an inability of western powers to find a clear and cohesive strategy to deal with the complexities of the Balkan Wars. NATO-led and then UN-led troops allowed massacres to happen (and this phenomenon is not just limited to the Balkans), because of a fear that the nations that had committed them would become fully involved in a conflict they had little, if anything, really invested in. Both Judt and Hobsbawm make clear points that dismiss the more conspiratorial arguments that the West planned to destroy Yugoslavia and worked to undermine it, but the argument that NATO was slow to act often fails to accommodate the scale of the problem Europe and America were presented with. The fact that intervention took place at all, that it was as successful as it was, and that there was a clear exit strategy, is perhaps the most surprising aspect to the Balkan Wars. International action, in the final analysis, did little to cause the Balkan Wars. Those actions which can be seen as contributory are, as both historians argue, acts of omission, not commission. The acts of commission by the West are those, ultimately, that brought the Balkan Wars to a close. Do you agree with the conclusion about the West’s impact in the 1990s conflicts in the Balkans? The author runs the site www.explaininghistory.com, a site that has a wide selection of interesting 20th century history ebooks. To find out about more articles by the likes of Nick, as well as other surprises, join us for free by clicking here! Judt, Tony. "The Way Things Are and How They Might Be." London Review of Books. 23 Mar 2010: Ex: 11-14. Web. 14 Oct. 2012. http://www.lrb.co.uk/v32/n06/contents. Judt , Tony. Postwar: A History of Europe Since 1945. 2nd. London: Vintage, 2010. 665. Print. Hobsbawm, Eric. The Age of Extremes. 3rd. London: TSP, 1996. 6. Print. Hobsbawm, Eric. The New Century. 1st. London: Little Brown, 2000. 19. Print. Keynes, John Maynard. The Economic Consequences of the Peace. 12th. London: Bloomsbury, 1971. 43. Print.